The Joshua Debunker channel on youtube has done an excellent job putting together a video of TB Joshua’s statement regarding John Zavlaris alongside Emmanuel TV footage that tells a different story. The question remains – why has TB Joshua lied about John Zavlaris’ connection with SCOAN? When will TB Joshua apologise for his MH370 lie? 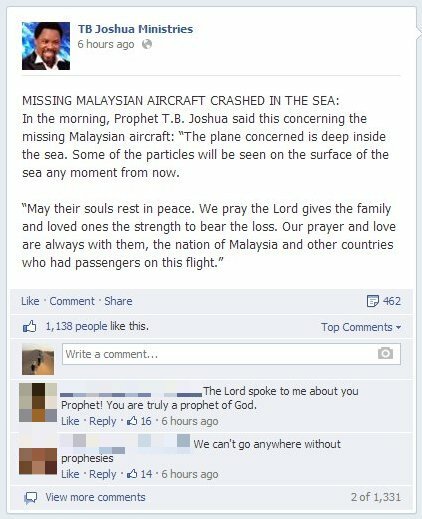 TB Joshua’s MH370 prophecy must be his most disastrous one yet. We are now a month from this prediction and no plane has been found. No debris has been found. An intermittent signal has been discovered, possibly from the black box, but nothing has been confirmed. There are a few other things he said such as the “strange people on board” and the plane being found “between Indonesia and the Indian ocean” that seem unlikely but are yet to be ruled out. However, so much of this is completely and utterly wrong, it can’t be excused. Even SCOAN are keeping quiet about this prophecy now. TB Joshua claims God shows him things in the future as clear as watching Emmanuel TV. We can see now that either he is lying to you and making all this up, or God doesn’t have a clue what is going on. Either TB Joshua is deceiving you, or God is deceiving TB Joshua. Pick your side. If TB Joshua has an ounce of integrity left, he’ll be issuing a full public apology and admitting he made a mistake. We hope this event will teach him a lesson and put a stop to this sick exploitation of human tragedy. REPOST: TB Joshua and deliverance. Is it biblical? [it] was the holy spirit in that lady who cofessed that tb joshua is the messiah of our time. In 2 Peter it says “But false prophets also arose among the people, just as there will be false teachers among you, who will secretly bring in destructive heresies” (2 Peter 2a). This is precisely what we appear to be witnessing here. TB Joshua isn’t publicly claiming to be the messiah of our time (as far as we know), but the way his ministry presents him evidently leads many to this conclusion, even the majority of his supporters if the sample set of our commenters is taken seriously. This lady was not the first person to call TB Joshua a messiah, and by leaving these claims unchallenged, it would appear SCOAN are secretly bringing in destructive heresies. A reader recently sent us an extremely disturbing video. The video was from Emmanuel TV, and showed a woman testifying to her recent deliverance thanks to the Anointed Water. In the clip below she calls TB Joshua the “messiah of our time” 3 times, and the interviewer makes no attempt to correct this. TB Joshua is responsible for what is broadcast on his TV channel, the fact that a statement like this has been made not once, not twice, but three times without being challenged should be a serious concern to all supporters of Emmanuel TV, SCOAN or TB Joshua. By broadcasting it they are supporting it. If they don’t support the statement, then we should expect a full and frank retraction. As we have covered before, this view is not uncommon. There are websites online with pages of articles claiming that he is a messiah, and plenty of SCOAN media gives this message implicitly. TB Joshua, the messiah. Is it SCOAN behind these claims?